Buy Face the Music: A Life Exposed from Amazon.com! So for several weeks leading up to this year’s Rock and Roll Hall of Fame induction I saw KISS trending in nearly every news site I follow. I get updates from Ultimate Classic Rock, and I received a KISS e-lert every damn day for a month. Lot of yakking back and forth. “Paul did this to us,” whined somebody. “Ace is still a damned drunk.” Yada yada. I asked my KISS-fan friend Joe if they got this much press at the peak of KISS-mania and he said no. “Mainstream media hated their guts,” he told me. In this book, Stanley touches a bit on the derision and odd looks they endured from the beginning – from labels, critics, and peers. To read how he looks back on the past, it’s clear he’s not embittered by it. “No Drama” fast becomes a theme, but it’s difficult to avoid. Stanley does admit his unwillingness to put up with the two-faced sort (using a blow-up with Slash as an example) and the desire to show up past naysayers (as illustrated in an anecdote about a high school reunion), but for the most part Face the Music is what happened and where with KISS, from inception to almost present day, as Stanley remembers. If you’re expecting four hundred pages of “screw Ace and Peter” you will be disappointed – probably because recent media hype of this book may have led you to believe it’s a bash-fest. Face the Music isn’t all prancing unicorns, either, but it is brutal and engaging in its honesty. Stanley’s pre-KISS years are marked by physical and emotional problems, everything from a dysfunctional family to a disability that luckily did not affect his musical ability. As with Criss, school offered little in terms of a future, and music proved the greater draw. Early interactions with Gene Klein/Simmons tell of a combined curiosity and skepticism that leads to a more “functional” dysfunctional relationship that remains intact. Early KISS antics roll through the seventies on mounting credit bills and a steady climb toward fame that explodes with the release of Alive! – and the subsequent buffet of women and expensive things. I get from this book Stanley had more fun recalling sexual conquests than dealing with financial problems that plagued much of their career (understandable). Where Criss had issues with KISS merchandise threatening to undermine the band and make them appear cartoonish, for example, Stanley argues the decision wasn’t any different from how The Beatles were merched a decade before them. People still go for their music, right? When you get to the chapters on the big reunion and tours, you may think you have to choose sides. Were Ace and Peter used to generate cash, or were they asked back to recapture old magic in a setting that stood to benefit everybody involved? Stanley argues for the latter – despite having two other musicians on the payroll, the full costume/makeup tour with the original four happened as a way to end that lineup on a strong note. From Stanley’s view, that was the hope, and it didn’t work out that way. And the accusations of racism that caused all the recent press? It’s maybe three or four sentences, one of which is vaguely worded. 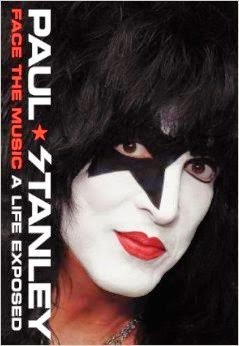 Early on in this book you feel Stanley’s discomfort as he remembers his first encounter with anti-Semitism (which involved neither Ace nor Peter), and it’s Stanley’s perception of his bandmates’ overall behavior that likely prompted the remarks, if only to create a bigger picture of conflicts within KISS as you read. I can’t say what Stanley thinks of Ace and Peter beyond what I have read here, but the passages read more like observation than accusation. What he has to say about Gene, now… no, nothing to do with race or creed. I’ll leave you with something to anticipate. I enjoyed Face the Music. Stanley’s enthusiasm for KISS as an entity, more than a band, is infectious. It ends in a good place, too. This went out before the HoF ceremony, and some might think that would make for a good coda to any story, but you read Paul’s book and know he’s nowhere close to finished. Kathryn Lively is a mystery author, editor and avid reader. Enter to Win the ARe Bad Boys Giveaway!